Aerodynamic dispergator consists of the following datum nodes: a horizontally-mounted rotor, composed of two disks, joint by radial blade. Rotor is put in cylindrical shell with special stator blades. Product selection is made from centre of apparatus coaxially relative to rotor rotation axis. Dispergator is linked with high-pressure fan by air duct at rotor rotation axis. The exit of fan is linked with cyclones, which are installed over discharge hopper. When dispergator is working, material is moved to dispergator through special loading gate and gets to rotor with blades. Material collides with blades and grinds, under inertial forces material particles tend to leave dispersion area. At the same time fan blows down air through dispergator in order to return material particles to grinding area, so, the generation of air-fluidized material bed at outer radius of horn rotation is executed. 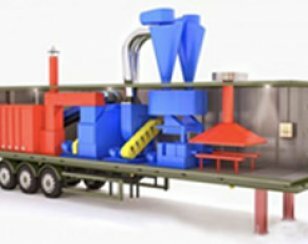 Particles traverse speed in air-fluidized bed is lower, than rotor traverse speed, that executes energy, which is necessary for material grinding. Material drying is executed owing to intensive air change. Air flow, providing drying of material, is up to 30 000 m3/hour, the flow rate is 25-28 meters/second relative to material particles, which are in a fluidized bed. Effective drying is executed when the air of temperature is 120 - 150 ° C, the approximate rate of thermal energy is 750-800 kW. to 1 tonne evaporated moisture. Grinding and drying of material is executed until material particles reach necessary size and humidity.int by radial blade. Rotor is put in cylindrical shell with special stator blades. Product selection is made from centre of apparatus coaxially relative to rotor rotation axis. Dispergator is linked with high-pressure fan by air duct at rotor rotation axis. The exit of fan is linked with cyclones, which are installed over discharge hopper. At a certain ratio of rotor traverse speed and air vent inertial separation of finished product is executed, whereas rough and humid particles won't be carried out from drying-grinding area, as they have more inertia, then fine and dry have. Aerodynamic dispergator construction allows to produce delicate and quick adjustment of finished product characteristics, as changing of inertial separation is reached by rotor traverse speed changing and by air vent volume. 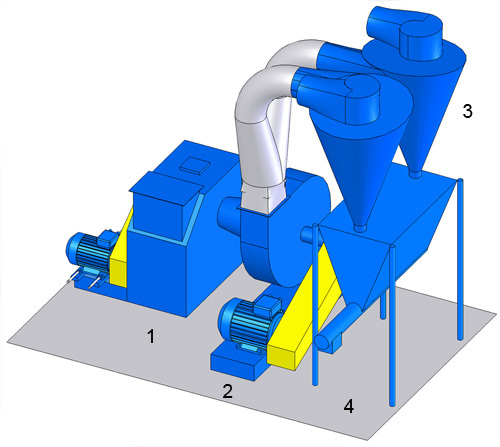 D Series – for efficient drying, grinding and separation of fine - dispersed materials in order to get a dry product of homogeneous granulometric structure. DR Series – for efficient drying, grinding and separation of lumpy materials in order to get a dry product of homogeneous granulometric structure. DE Series - for efficient drying, grinding / defibration and delicate separation of fine - dispersed materials in order to get a dry product of homogeneous granulometric structure (powder, fibers etc).